Pilot Mall’s new user-configurable instrument panel for table-top basic flight training devices is making its public debut this week behind Hangar B at the Sun ’n Fun Fly-in in Lakeland, Fla. The Flight Training Cockpit–Advanced Panel, brainchild of Pilot Mall president Neil Glazer and Michael Moore of Coldwater, Ontario-based Redfab, is designed to work with Microsoft Flight Sim on a PC platform. It uses Saitek ProFlite instruments, avionics and flight controls in a 21- by 31-inch metal instrument panel with pop-out cutouts. 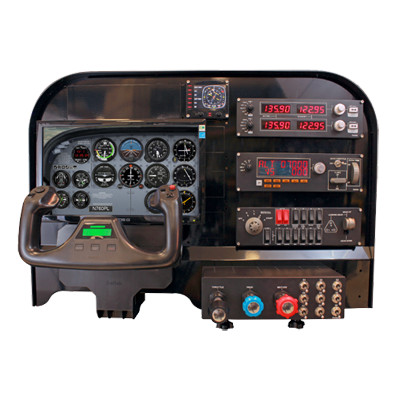 The panel can be customized from primary instrumentation to fullIFR, simulating anything from a fixed-gear single to complex twin for the purpose of instrument training or proficiency. “The full system costs less than custom flight sim cockpits from other sources,” said Glazer. “Advanced Panel works with familiar Microsoft Flight Sim software on the customer’s own PC. It uses off-the-shelf components that Pilot Mall already sells combined with our new instrument panel with punch-outs for adding features and an innovative way of securing the five-inch-deep unit for table-top use,” he explained. “All you need to add are some USB hubs and your computer monitor to create a realistic single-engine flying experience–with visual–for about $2,500, with special introductory pricing during Sun ’n Fun.” The addition of a multi-engine throttle quadrant and full-size trim wheel are additional options, according to Glazer. Building blocks for the Advanced Panel are 5- by 5-inch Saitek computer-driven instruments with 3.5-inch LED displays that can be installed with an Allen wrench and configured at the push of a button. Placement of the Saitek instruments, avionics and flight controls is up to the user. Annunciator panel warning and status lights can provide up to 50 advisories in red, orange or green to match the aircraft being flown. The panel also supports nine programmable toggle switches. Pilot Mall confirms that the new hardware is compatible with all major Microsoft Windows-based flight sim titles through downloadable drivers. Tech support is available from both Pilot Mall and Saitek. Pilot Mall’s new user-configurable instrument panel for table-top basic flight training devices, which works with Microsoft Flight Sim, uses Saitek ProFlite instruments, avionics and flight controls in a 21- by 31-inch metal instrument panel with pop-out cutouts. The Advanced Panel is making its public debut this week at the Sun ’n Fun Fly-in in Lakeland, Fla., where it is available for a show-special price of $2,500.